I don't know if it is possible to create a pdf with password security enabled, that also allows extraction of pages. I havn't found any property in itextsharp which will allow enable page extraction. This is the property that i would like to enable. I can't find any permission bit that refers to page extraction. I have tried setting all the flags that are documented in ISO-32000-2, but they didn't result in setting the Page Extraction to Allowed. As the permission isn't described in ISO-32000 and as there doesn't seem to be a way to set this permission in Acrobat, I'm inclined to believe that there is no way to set this permission. The only way to see "Allowed", is to open the document with the owner password. Please update your question as soon as you find a way to set this permission with Acrobat. I'm using Acrobat XI Pro. On another note: setting the permissions the way you do (using only an owner password and without a user password) is only a psychological, NOT a full-proof technical way to enforce protection. See How to read PDFs created with an unknown random owner password? 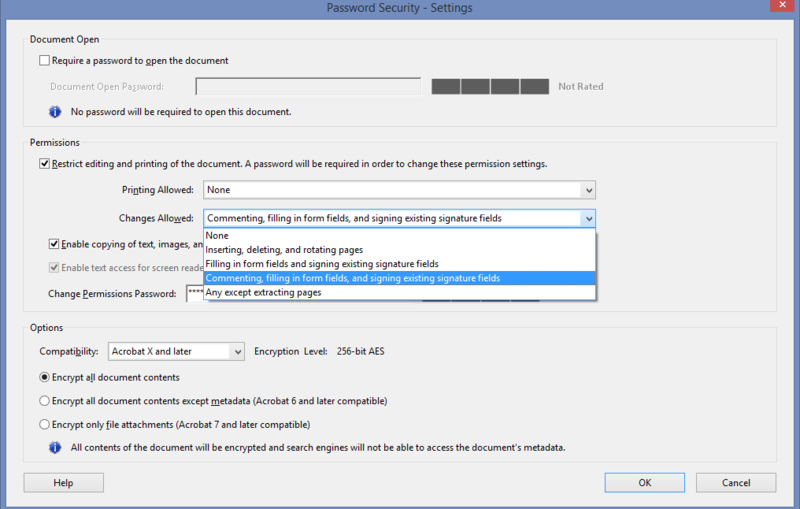 to find out how to remove permissions from a PDF that is only protected using an owner password. Using iTextSharp.text how to allow all security settings except 'Document Assembly & Page Extraction'?